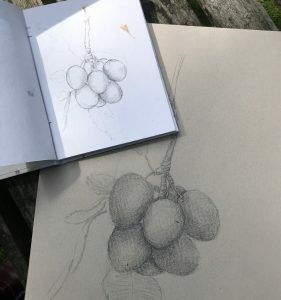 Having revisited a 15 yer old Corsican walnut line pencil drawing and been inspired by the similar growing Figs structure in West Wales in the summer of 2018, I was surprised to come across ripening Damsons growing in a Birmingham garden. Blooming blue, purple as their weight drew them ever closer to the ground below. Here we have another voluminous fruit with stems, branches and leaves supporting them to fruition. 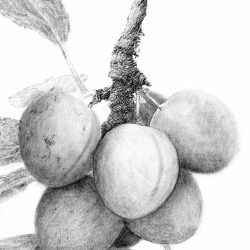 Like the surprise fig find, the damsons inspired more drawing. But unlike the figs when I reached for the electronic iPad, I was lucky enough to have been given two very different sketchbooks recently from a printmaking studio clear out. 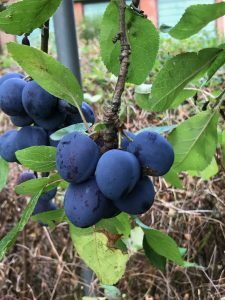 Although very different in size, paper, colour and quality I embarked upon drawing a selected bunch of 6 damsons with a 6B lead pencil before they over ripen, split and drop. 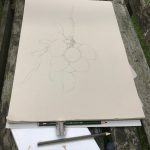 The first drawing was in a small sketch/notebook with its own leafy design printed throughout. The first page was mainly clear for the drawing and I began by making a basic line drawing capturing the fruit’s composition on the A5 page. 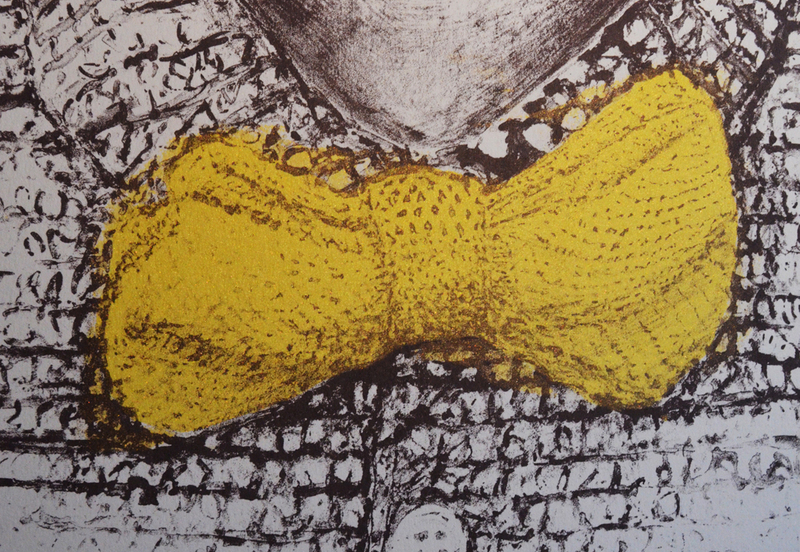 The 6B and the cloth like texture of the page allowed for a soft approach rather than a fine detailed representation. It was enjoyable to feel my way through the fruits and their shapes, for although they all appear to be oval, they each have their own distinct shapes, which may not always be the uniform oval. They may have grown together in a fashion that encouraged uneven growth, with the odd bump or straight edges within the overall oval curves. 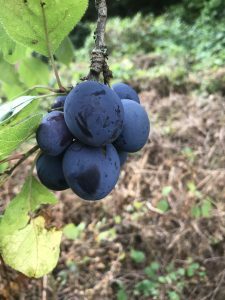 The branch has its own round core with its uneven ridges of growth to support the ripening fruit. 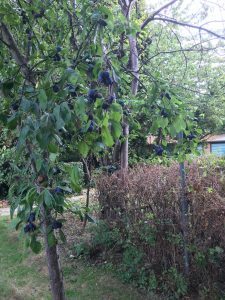 The end of the branch is the opportunity for the thin green stems to grow out to hold, connect and feed each of the relatively massive purple fruits. I wondered how they knew how and when to let go of their charges. 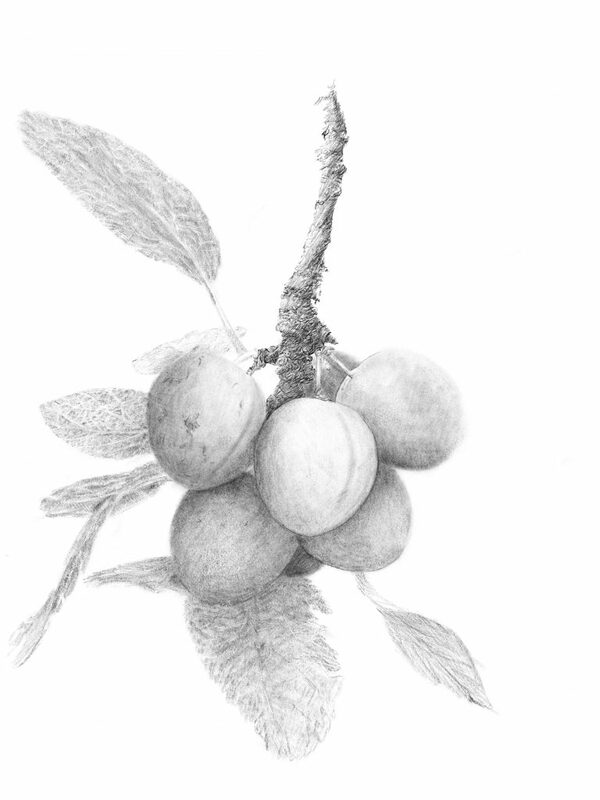 Shading the fruit, branch and adding impressions of the leaves made a sketch rather than a drawing. 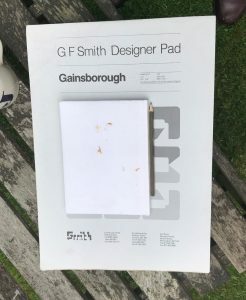 Picking up the A2 Gainsborough Designer Pad was a very different proposition because of its size, weight and the need to hold it high and draw while looking up. However the major difference was the texture of the paper. More a Felt dimpled finish. 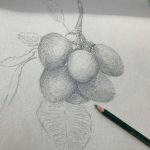 The larger drawing space allowed for more freedom to create shaped fruits and branch, but the rough texture had its own grain that became more prevalent as the lead built up. The paper and pencil choice made for a textured impression of the damson bunch giving shape and volume to each fruit from a distance. However the vertical texture revealed itself on closer inspection. 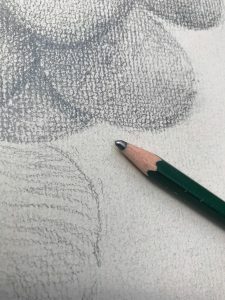 This is fine for an impressionistic drawing, however damson’s are a smooth finished fruit and perhaps there is another combination or method that can be applied to reflect the surfaces in the composition. Additional smooth paper and pencil selections could be found, however I could feel the tablet and Apple Pencil calling me to experiment with their capabilities. 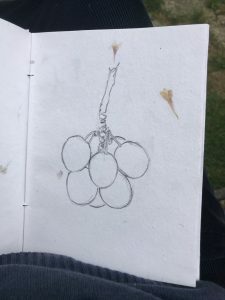 Before following that route I realised I had not been so observant on the A5 cloth book drawing to see the 7th damson hidden behind the foremost fruits which is included in the A2 drawing. This smart phone photograph of the bunch from another angle that reveals not 6 or 7, but 8 fruits! 6,7 or 8 damsons – This clip, by beginning with a front elevation view and panning round to the profile reveals how many damsons are actually on the branch. Picking up the iPad I selected a 6b pencil to draw the branch holding the fruits with all its knurled growths and protrusions. Parts of the branch were drawn over to create the smooth lengths between growth stages. For the fruits I tried a ‘blunt pencil’ in the hope that broad strokes could create the smooth/velvet fruit skin finish, but it felt to brash. Switch to 6b. Much better for the range of tones needed to achieve each fruit and their position in relation to each other. The leaves needed to be given shape with the pencil shading by drawing at an angle to create width of mark, rather than line. The veins of each leaf were made with pencil line followed by eraser line to provide highlights. The clip below captures the drawing process. In preparing the digital drawing for this article it was exported as a pdf (portable document format), imported into Photoshop and converted to a smaller jpg file for uploading here. However an auto tone function can be applied. The result is below. It is has much more contrast, which while viewing on screen gives a denser tonal range, greater the dimensions and volume to the fruits. I shall leave them both here for screen viewing and later print onto paper for comparison.